As a parent, you have to think of a bunch of different things to bring along with you every time you leave the house. If we just run out for a quick errand, I won't even bring the diaper bag. But when we go out for the whole day, I have to be smart about packing everything that we need. -Light blanket- to use as a nursing cover, for spitup, to sit on, etc. 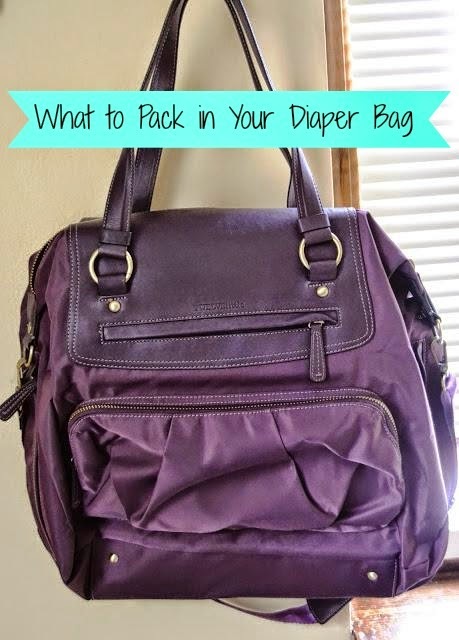 When it comes to a diaper bag, I want something roomy with extra compartments to store different things. I was sent this TWELVElittle allure weekender bag in plum. It is very large and is perfect for a whole day trip. It has 5 interior pockets and 6 exterior pockets so there is tons of space for storage. I love this bag! It is beautiful and high quality. We are going on a short overnight trip that I will take this on with Adalyn's stuff (UPDATE: I took it on a trip and LOVED it. It is the perfect bag for a weekend trip. It will be great for all of our upcoming summer adventures. I don't carry a purse anymore so I like that this has plenty of storage for my stuff as well. It has a hidden pocket to store dirty items and has a long strap. It is available in the beautiful plum color that I was sent as well as black and beige. It is sold at Diapers.com and buy buy Baby.